Update - now with pic. And I just realised my faux pas - this is not an indian curry, but a Surinamese one! All hail the people from Suriname (and their wonderful curries). 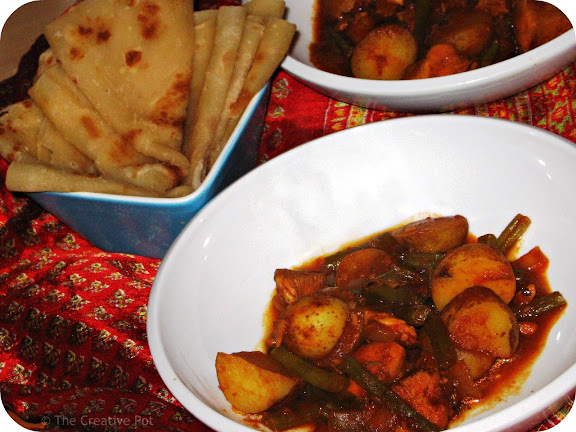 Made this for our Bollywood Dreams evening (will post the rest of the recipes later, I promise! ), but left out the potatoes and beans (I had some other veggie side-dishes and didn't want this competing with it. This was inspired by Dutch Girl Cooking's recipe and it is super delicious. She also has a recipe for home-made roti's on there that I'll have to give a go sometime. 1. Heat half the oil, add half of the chopped onions, 1 1/2 tsp garlic and cook for about 3 minutes. 2. Add 1 1/2 tsp curry powder, and a pinch of cumin. Crumble up half the stock cube and add that as well. 3. Cook briefly, then add the potatoes and green beans, stir and cook for another minute before pouring in the water/chopped tomatoes in juice. Put the lid on and simmer, over low heat, for 10 minutes. 4. In a seperate frying pan, heat the rest of the oil, and add the remaining onions, garlic and chili pepper. 5. Cook for 3 minutes, then add 1 tbsp curry powder, the remaining stock cube (crumble it) and the tomato paste. Cook for 1 minute to blend all the flavours together. 6. Add the chicken to the tomato-onion mix and cook for a few minutes, until the chicken has browned a bit. Add the chicken mix to the potatoes and beans and stir. 7. Season the chicken and potatoes with some salt and pepper. Put the lid back on and simmer for another 20 minutes; until the chicken and potatoes are well done.